It’s dinner-time and you’ve been running all day. The kids will be home in a few minutes, your other half is right behind them, and all they want to know is “what’s for dinner?? ?” Allow me to introduce you to your new dinner best friend … pasta carbonara. “Carbonara?” you say. “I’ve been eating that for years. What the heck is so special about that? ?” Well, my friends, you only think you’ve been eating it for years. If you order it in a restaurant and one of the ingredients is heavy cream, it’s not an authentic carbonara. The classic, authentic Roman creation contains only 4 ingredients – pasta, eggs, romano cheese, and bacon. That’s it. For many of us, these are ingredients that are always in our fridge and pantry. Welcome to dinner. Or brunch. Or midnight post-party snack. The first time I had this dish was in the kitchen of a former Italian boyfriend, and man, was it a revelation. (The pasta, not the boyfriend.) So simple, so soulful, so satisfying. (Again, the pasta, not the boyfriend.) 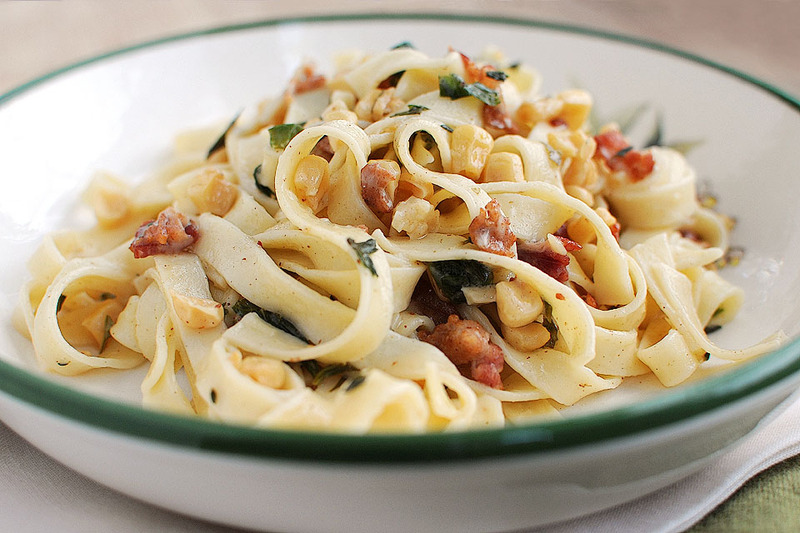 Just cook the pasta (I love it with fettucine or pappardelle), cook the bacon. Drain the pasta, put it back in the pan with a tablespoon of bacon drippings. Pour in beaten eggs and grated Romano cheese, and use a tongs to toss and stir. The heat of the cooked pasta turns the beaten egg into a thickened, satiny sauce in about a minute. Tumble in the cooked bacon, tong it through. Pile into bowls with loads of grated Romano cheese on top. The boyfriend is a memory, but the pasta remains. Dinner is served!! Cook the pasta in a large pot of boiling salted water until barely al dente. Cook the bacon while the pasta cooks. Scoop out the cooked bacon pieces and discard all but 1 T. of the bacon drippings. Beat the eggs with the 2 T. grated cheese in a bowl. Season with black pepper. When the pasta is barely al dente, drain it and put it back into the pot. Pour in the warm bacon drippings, and quickly toss. Add the egg mixture all at once and toss with tongs for one-two minutes, until the egg mixture becomes slightly thickened, satiny and clings to the pasta (This must be done off heat, otherwise you’ll have scrambled eggs and pasta. No bueno.) Tumble in the cooked bacon pieces and toss once more. Tong into serving bowls with a generous handful of grated Pecorino Romano. Buon Apetito!